Now entering his third decade of Indy Car racing, Roger Penske would experience a flood of emotions from more hallowed victories at the Speedway to multiple Drivers’ deaths. Yet as always, once again The Captain has come out smelling like a rose with the inking of Will Power to a full time ride at Team Penske! Rocket Rick became the very first driver to ever capture five Pole positions at the Speedway that May aboard a Penske PC-18/Chevrolet, having tied Rex Mays feat of capturing four poles the previous year, in which Mays had accomplished back in 1948! Yet, it would be Emerson Fittipaldi capturing his first Borg Warner trophy for Pat Patrick and Chip Ganassi in a customer Penske PC-18/Chevy that year, with “EMMO” enroute to the CART Championship crown at year’s end. Having been beaten by the customer “BAD HABITS” Marlboro team of Patrick/Ganassi... Penske did the sensible thing and hired reigning CART Champion Fittipaldi to drive for him, hence forming a three car line-up for the season. And EMMO immediately repaid The Captain by claiming the Pole at Indy, securing Team Penske’s third consecutive Pole position at the Brickyard, with Rocket Rick starting from “P2,” while “Sully” (Sullivan) rolled off from ninth, but it was to be some cat named “The Flying Dutchman” Arie Luyendyk’s day at the Speedway instead. Rick Mears now looking somewhat out of character, in Marlboro red and white versus his most recognizable Pennzoil yellow, albeit having made the switch the year prior, garnered the sixth and final Pole of his storied career at Indianapolis that May, becoming the only driver to date to accomplish the feat. Thus starting from Pole, in what has to be my most favourite Rocket Rick win at the Speedway, when he made the move affectionately known as “The Pass” upon Mikey Andretti enroute to his record tying fourth Indy 500 victory at the Speedway during the 75th Memorial Day classic, Mears would only contest a single Indy 500 afterwards before announcing his retirement. Rick Mears was replaced by a young, brash Canadian named Paul Tracy, who qualified seventh before crashing out on lap 94, while team leader Emerson fittipaldi started ninth. Emerson went onto score his second and final Indy 500 victory after a late race tussle with Little Al, then driving for Rick Galles, as Unser Jr. stood by his wrecked racecar waiting for EMMO to pass by and then flashing him two thumbs up before going to the awaiting Ambulance. Yet, I believe more noise was made over the Brazilian shirking tradition by drinking Orange juice in Victory Lane instead of Milk in deference to his burgeoning OJ concern back home in San Paolo vs. winning Indy. Truly an epic season for Penske Racing, as The Captain’s Indy Car team was nearly unbeatable, with Al Unser Jr. winning a total of eight races, including that year’s Indy 500 with the all conquering Mercedes Benz “Stock Block” engine enroute to his second CART Championship, while Paul Tracy scored two victories and Emerson Fittipaldi managed to secure a lone victory that year, it was to be one of Roger Penske’s most successful seasons ever. While many may recall that this was the year that tragically Gregg Moore was killed on Halloween at Fontana Speedway, ironically owned by Roger Penske at the time, as Moore had previously committed to drive for Roger the following year, does anybody recall that Rookie Gonzalo Rodriguez was killed at Laguna Seca Raceway on September 11th, in what was to be only his second start ever, while driving for Penske Racing, which at the time had a revolving door policy for its second car alongside the slumping Unser Junior, as unfortunately Rodriguez was fatally killed at the “Zanardi Curve,” better known as the Corkscrew after slamming into a concrete retaining barrier at 140mph. And we now also know, that it was Penske’s inking of Helio Castroneves as Moore’s replacement via Carl Hogan that apparently a slighted Emerson Fittipaldi felt obliged to drop the dime upon his ex-charge Hulio in a wrangle over management fees. Gil De Ferran driving a Reynard-Honda captures the CART Championship, breaking Chip Ganassi’s four year stranglehold on the Vanderbilt Cup. Having witnessed rival CART team owner Chip Ganassi’s Juan Pablo Montoya obliterate the competition at Indy the previous year, when the first seven finishing positions were held by CART Drivers, Roger Penske could not stay away from the hallowed Speedway any further, entering two cars for his team, which would see a most welcome return as Helio Castroneves would be victorious with teammate Gil De Ferran runner-up, who would also go onto capture his second Vanderbilt Cup for what was to be Penske’s final season in CART. Roger Penske rocked the establishment by deciding to leave CART in favour of the Indy Racing League, in order to be able to contest that year’s May classic fully emblazoned in Marlboro livery, as the nasty “BAD HABITS’ Tobacco sponsorship was now confined to only one series per team entry. And The Captain didn’t fail to deliver as once again Castroneves won the epic event enroute to becoming only the fourth driver ever to have his “Mug” etched upon the Borg Warner trophy two consecutive years in a row, which wasn’t too shabby of a batting percentage in his first two attempts at the Speedway. 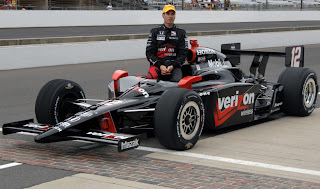 Yet I recall gleefully indulging upon Panther Racing’s Sam Hornish Jr. securing his second IRL title over Penske Racing that season. Gil De Ferran finally accomplished his goal of beating pesky teammate Castroneves enroute to earning his lone Indianapolis 500 victory before ultimately retiring from Indy Car competition, making way for perennial IRL thorn Hornish Jr. to join Penske Racing’s fold, as Roger had still not managed to win an Indy Racing League title! Finally, Roger accomplished his goal of winning an Indy Car crown as Sam Hornish Jr. not only won the Championship, but that year’s Indy 500 from the Pole position as well, in an epic last lap pass of 19 year old Rookie IRL competitor Marco Andretti, thus notching Penske’s unprecedented 14th Borg Warner trophy. Yet obviously the big news for Roger Penske over the winter was the plight of “lead” driver Castroneves, as Hulio was indicted upon Tax evasion charges along with his manager/sister and lawyer, whom as we all painfully know were acquitted. Thus, having previously inked Will Power to a back-up/replacement contingency Driver plan in case Hulio was incarcerated, Penske once again decided to field a three car armada for the month of May, with Power driving the Penske Racing No. 12 Verizon Wireless racecar, while Castroneves returned full time to his No. 3 and Briscoe continued on in his No. 6, while Power’s fate for the remainder of the season was unknown at that moment, Penske cleverly crafted together a partial season for the promising Australian. After winning for The Captain in dominating style at Edmonton in a retro-theme Penske Trucking paint scheme during the summer of ’09, Will Power had an unfortunate crash at Sonoma, CA which saw him break his back, leaving Power to ponder over the winter if he’d return to Penske Racing in 2010?